Despite the persistent cold and snow, this spring has felt so much easier than the last. When I think about what we were doing this time last spring, I’m amazed we pulled it off. 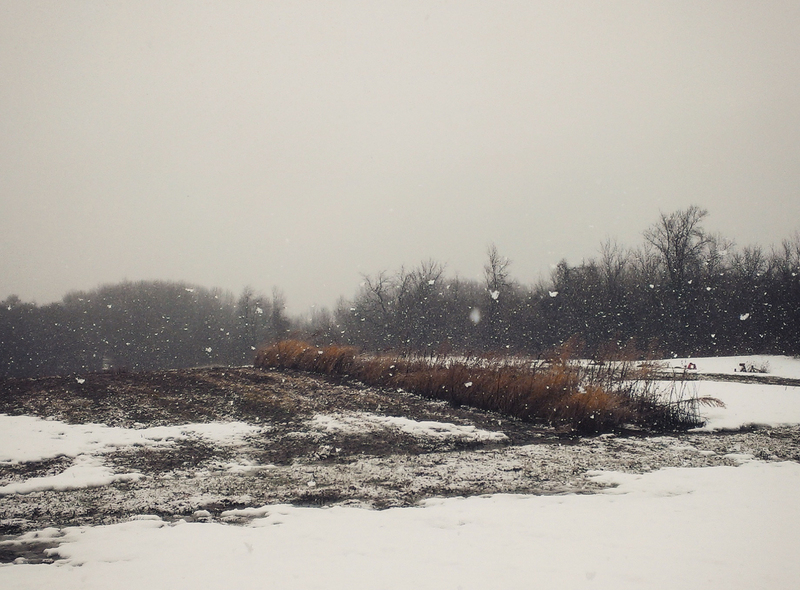 We were struggling with similarly cold, frozen conditions, but the farm looked very different; it was primarily a field of weeds, with a couple sections plowed the fall before. No parking lot, no greenhouse, no electricity or water… we had so much work to do. 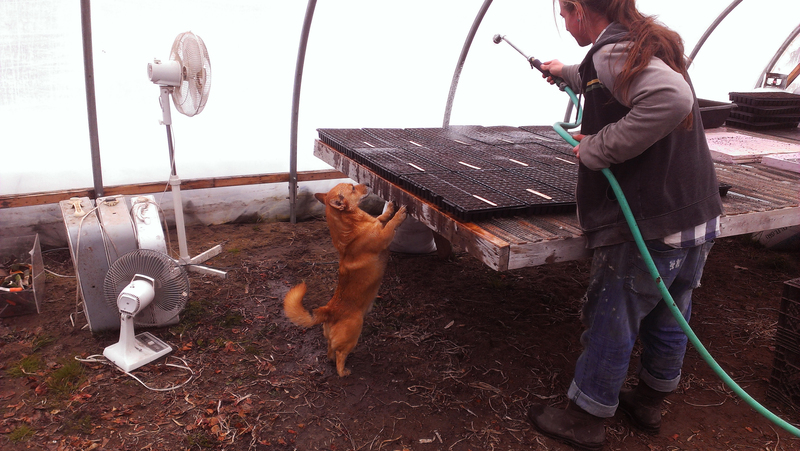 This year we were able to add a little more weather stripping to the greenhouse doors, order some propane and potting soil, and get seeds started. It took one day. It was nice. I’m not done improving the farm, though… I’ve got all sorts of plans in the works! Some will be implemented this year, some are long term plans (and some are long, long term), but this is the time of year for dreaming… the longer days and singing birds wake me up from my winter stupor, but the cold and wet keep me from doing everything I want to. What else is a farmer supposed to do but dream? Here are some of the things I’m excited about right now. Mike made me promise to change that title, but until I come up with another name, that’s what they will be in my head. Making the pick-your-own section more easily accessible to everyone has been a problem I’ve been working on for a couple years now. The you-pick section is one of the things I love most about Mud Creek. 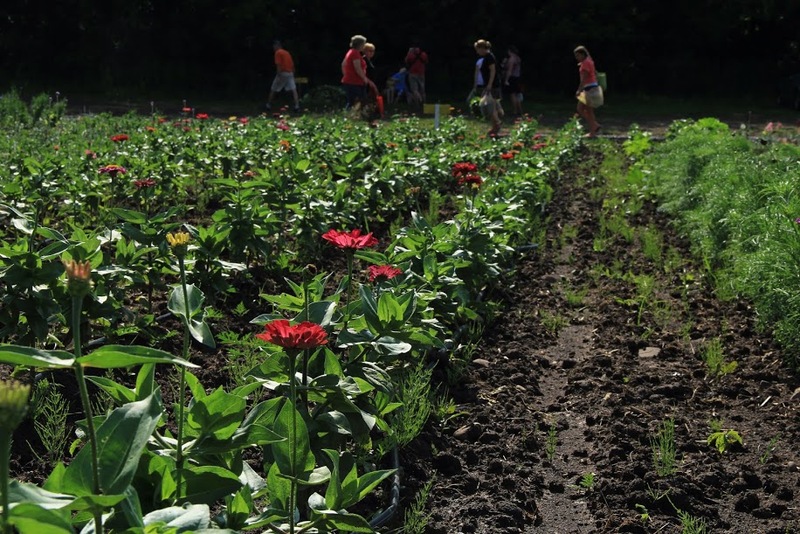 It lets people treat the farm as their own garden, it’s a beautiful oasis for members from the rest of the hectic world, and it’s a place for kids to learn about food and flowers in a fun, carefree way. Time can disappear in the you-pick section. The problem is if there’s something keeping you from getting out there, be it physical or not, or getting out there and feeling overwhelmed or lost. Thus You-pick Fairies. I got the idea from Mike Soto, who worked at the farm last year. He loved to wander the pick-your-own section during distribution, helping people find the scallions, showing them how to pick beans or peas, sharing tips, etc. This year Mike is working one day a week in exchange for a share, and will be the Monday You-pick Fairy… in addition to wandering the fields and helping where he can, he will be picking things for folks who can’t make it out there. There will be a fairy for Thursdays, too, yet to be determined! I’m tired of impermanent structures covered with tarps; dealing with snow collapse, wind and rain coming in the leaks, muddy ground instead of a floor… They made sense when we weren’t sure where we would be in a year, but now that we have a longer term lease and are invested in our new home, it’s time to think about a barn. Of course there’s a big difference between thinking about one and affording one, and I didn’t anticipate being able to afford one for a few years yet. Then one fell in our lap! 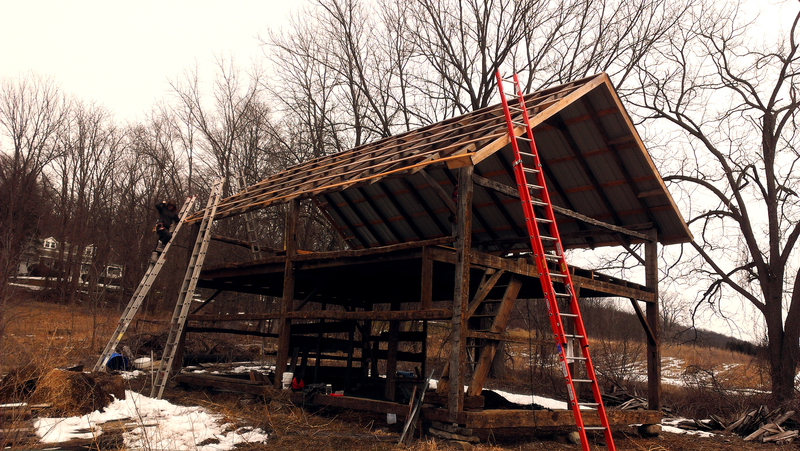 My friend Eli is moving on from the farm he started in Groveland, NY, and one of the things he put up there was a free barn he got from an old dairy farm down the road. Now that he’s moving on, he offered it to us, as long as we can take it apart and move it. Which we’ve been doing this spring. This Tuesday will be the final push, taking down the frame and bringing it to Mud Creek to store for the summer. It’s a 20×30 structure, with a second floor loft. It’s not as big as we will need long term, but it’s a good start, and we can always add on. To put it up at the farm, I will need to get permits and construct some kind of foundation, so it won’t be in use for this season. 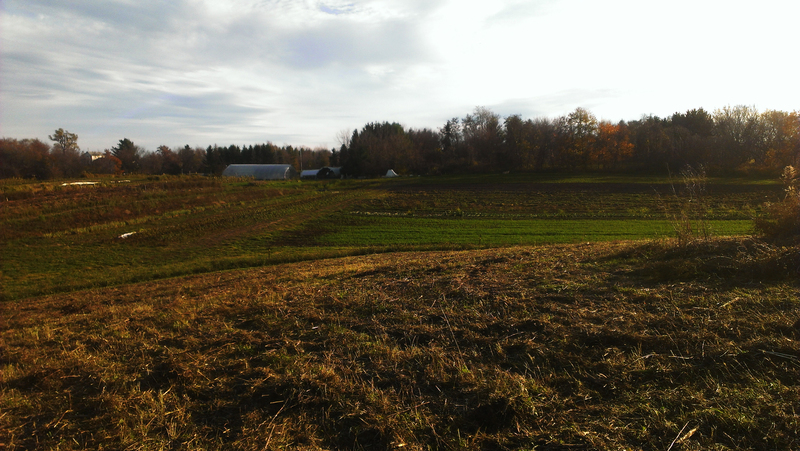 The plan is to construct the foundation this fall, after the final distribution, and put up the barn this coming winter or the following spring. I’m continuing to research and dream about a fruit orchard growing out on the hill behind our fields. I recently got to see an amazing film about a farmer in Montreal who has a permaculture orchard CSA, and it inspired me and helped me focus the dream a little bit. I can more clearly imagine what it would look like, and Josh is excited about it too. We will start planning it out this year. Josh has jumped into the chicken project feet first, and has been growing his flock all winter. I’m excited to have some more animals on the farm this year, and be able to offer chicken and eggs to members during distribution. 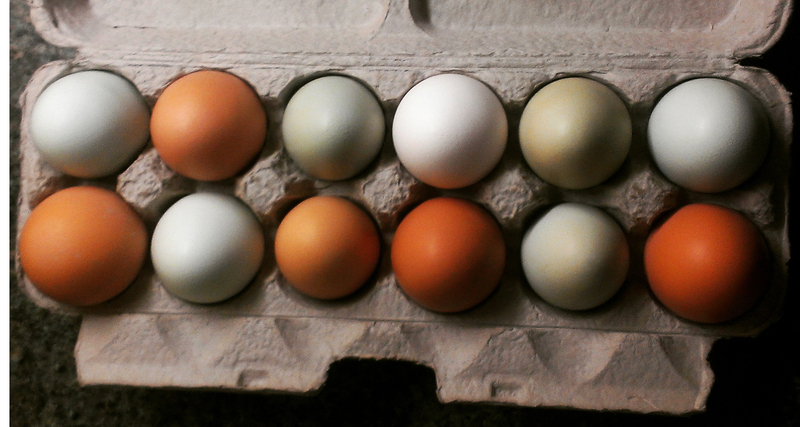 Josh wants to eventually offer eggs as an additional “egg share,” but this first year he will simply sell eggs at distribution while he solidifies the plan and gauges interest. The other positive of chickens on the farm is the benefits they provide to the whole farm system… since we will be able to move them around, we can put them on vegetable fields after we harvest, letting them eat weeds and bugs and fertilize the field for the next year. I’ve always put a recipe or two in the weekly newsletter, especially trying to find ones for the more unusual vegetables in the share that week, but it’s hard to keep up with it, or provide enough info on how to use the whole share easily. I’m always a little worried that people will become overwhelmed and then feel guilty or frustrated when food goes to waste. So this year, I’ve got a subscription for all our members to a website called “Cook With What You Have,” created by a remarkable chef named Katherine. 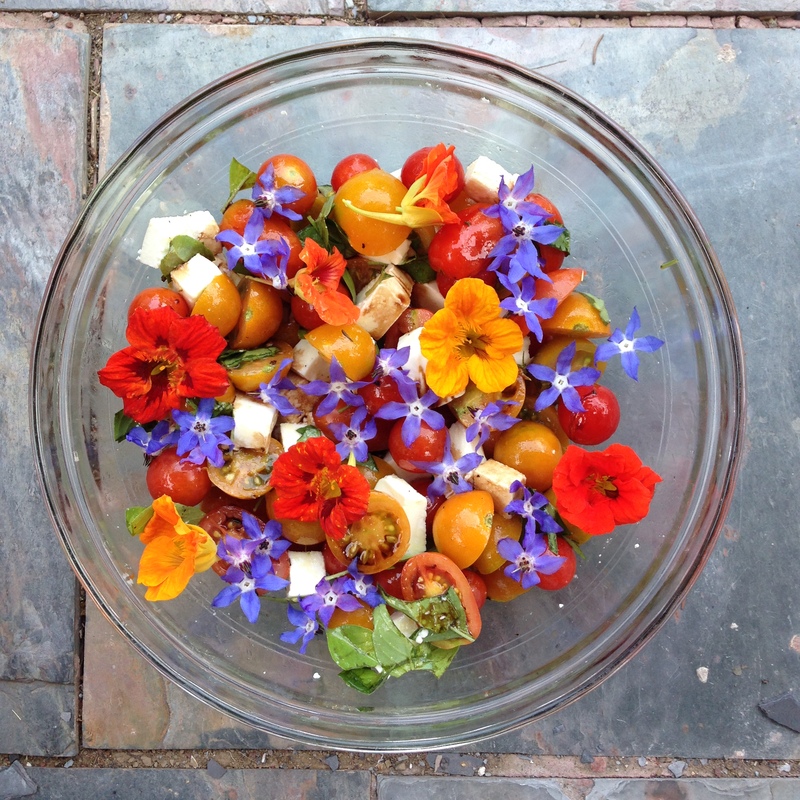 The site has recipes for all the different vegetables you may find in your share, often with other seasonally appropriate ingredients, in an easily searchable database. (Here’s a sample page to check out!) I’m excited to see how members react to this addition. So those are the current dreams I have. I’m sure they will change and multiply as the days pass. Here’s looking towards a great year!